Violent street protests, walkouts in parliament, and scuffles among politicians -- an effort to introduce new national ID cards is causing an identity crisis in Afghanistan. The Afghan government wants to issue biometric cards to citizens in time for the country's presidential election in April to help curtail voter fraud and promote national unity. But the omission of citizens' ethnicity has instead highlighted Afghanistan's historical ethnic divisions, largely because critics believe putting everyone under the "Afghan" umbrella is politically advantageous to the country's largest ethnic group, the Pashtuns. The resulting uproar has derailed the government’s plan to distribute the cards. Ethnic rifts run deep in Afghanistan, and ethnicity is closely tied to citizens' broader sense of political and social identity. Some argue that, with precise population estimates unavailable because Afghanistan has never conducted a nationwide census, documenting citizens' ethnicity on the national ID card could help the government accurately determine the size of the country's various ethnic groups. 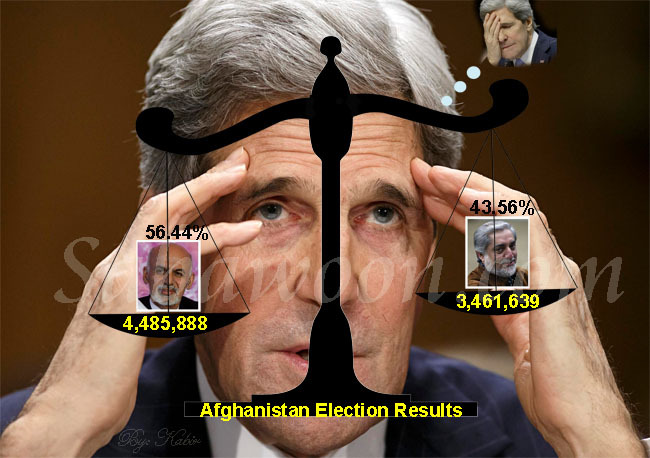 This is an issue because ethnic minorities in Afghanistan argue that population estimates used to determine political representation greatly overstate the percentage of Pashtuns, which results in the group taking a greater share of power than it deserves. Advocates of the effort to forge a common Afghan identity, however, say singling out citizens' ethnicity could be divisive. Excluding mention of ethnicity on the ID cards, they argue, could promote unity in the volatile multiethnic country. Under the proposed format of the new biometric documents, known as "taskera," holders' ethnicity would in fact be contained on the cards' smart chips. Their ethnicity, however, would not be printed on the face of the card itself. In addition to the words "Islamic Republic of Afghanistan" identifying the card as an official state document, the cards would also feature the word "Afghan" to describe the individual cardholder. This is not suitable to citizens such as Haydar, a Kabul resident who argues that the country needs to ensure fair political representation. "The new ID cards should mention Afghan nationality but also whether a citizen is an ethnic Tajik, a Hazara, or an ethnic Uzbek," he says. In lieu of a national census, the government has relied on figures compiled from sample censuses dating back to the 1970s to determine the country's ethnic makeup. The fact that Afghan governments have been dominated by Pashtuns has helped fuel sentiments among ethnic minorities that they are being politically marginalized, and even that the Pashtuns have a stake in preventing a national census from being conducted. Even the word "Afghan" itself, which is historically synonymous with Pashtuns, is a source of contention among members of minority groups. Halim, a student at Kabul University, says the country needs to abandon such lines of thinking. "If Afghan nationality is not printed on the cards, then how are we to identify ourselves?" he asks. "Nationality must be included. If nationality is omitted then the name of the country itself will come under threat and will be changed too. Soon after that people will question the name of our currency [afghani] and also blame that on Pashtuns." The proposed national ID card project is expected to cost $100 million, and will be paid for by the Finance Ministry. The government has said the new system would cut down on electoral fraud and help it develop better social and economic policies, among other things. So far, as evidenced by a very public row playing out in the Afghan media and parliament, the issue has only inflamed ethnic tensions. Abdul Wahid Taqat, a retired Afghan general turned political analyst, was arrested on December 12 after making a series of inflammatory remarks on a talk show on Zhwandoon TV, a Pashto-language television station based in Kabul. Taqat reportedly said ethnic minorities, including ethnic Tajiks and Uzbeks, should go back to their countries and that Afghanistan was the land of the Pashtuns. His arrest came after the Attorney General's Office on December 8 launched an official investigation into the discriminatory remarks made by Taqat. He and several Zhwandoon TV employees were summoned for questioning. Hundreds of Kabul residents staged a demonstration on December 7 to protest against Taqat and Zhwandoon TV. The protest was only one of dozens that have sprung up across the country in reaction to the proposed card system. The controversy over Zhwandoon TV came after a bust-up during a Senate session on December 2. While the Senate was debating the merits of the new cards, several lawmakers flung water bottles at each other, prompting a brief scuffle. The Afghan parliament has itself further muddied the waters. The Wolsei Jirga, the lower house of parliament, approved a law to print ethnicity on the cards earlier this year. But the text of the law sent to and approved by the Meshrano Jirga, the Senate, excluded ethnicity from the cards. A special commission is currently trying to settle the dispute. At the center of the investigation is Mohammad Saleh Saldzhuki, the speaker of the lower house of parliament, who sent the letter to the Senate. He has been accused of changing the original text. Saldzhuki is currently being questioned and has not spoken to the media. Abdullah, a shopkeeper in Kabul, says ethnocentric views are very dangerous. He cites the country’s devastating civil war in the early 1990s, which was fought mainly along ethnic lines. Abdullah accuses opportunistic politicians of using the issue to garner support ahead of presidential and provincial elections slated for April. "We are all living in Afghanistan and we are all Afghans even though our ethnicity is either Tajik, Uzbek, Hazara, or Pashtun," he says. "This issue is being used by some figures as a political tool."